Announcing the winners of the 29th ever Right Place Photo Caption Contest! I was hoping this would be one of the best caption contests yet, and you folks did not disappoint! Be sure to see many more funny captions in the original comment section linked above, as there were just simply too many to list them all! Presenting the top 25 captions for this picture from AP Photo/Al-Jazeera/APTN, File via Yahoo! #25: "I'm with you, dude - I haven't got A CLUE what those gold squiggly lines mean." #24: "An IUD for a camel? Could be, I guess." #23: "I'm sorry, I forgot... which one of us is the 'good cop' and which is the 'bad cop'?" #22: CNN tagline: "Afghani patriots consider their next move." #21: "Next up on the swap shop, Osama has a nice shiny thing he would like to sell. Osama, could you tell us what it is?" "Well, I'll tell you, Abu. It's all that's left of my solid gold 4-poster that was in my cave when the infidels blew it up." #20: "Did you see last night's episode of 24?" #19: "Ayman, have you ever felt, you know, not so fresh?" #18: "Oh, Great Osama, Destroyer of Infidels and Uniter of the Muslim World... Most Holy Vanquisher of the Great Satan and Representative of Allah... Could you pass the bong this way?" #17: "Well, since it was your idea to have a picnic, I assumed you'd bring the picnic basket!" #16: "I think it would make a fine hood ornament, but we don't have anything but camels and donkeys out here." #15: "You take the goat tonight, Zawa - I'll take the sheep..."
#14: "What is that whistling noise?" "I don't know, but its getting closer." #13: "One day, al-Zawahiri, all this will be yours." #12: "I've been thinking, Ayman. Because I have you, I don't need 72 virgins." #11: "So, that's your plan? We just sit here with towels on our heads and wait for the Vogons to give us a lift?" #10: "Ya' know, Zawa, if we use a fake name and kill the pizza delivery boy, no one would know that we ordered sausage, pepperoni, and Canadian bacon on that extra large." #9: "Sooooo... uhm... you brought us all the way out here to, uhm... 'go camping', and all you brought was the one sleeping bag... hmmmmmm..."
#8: "Oh, Brother Osama, I am filled with confusion... What do you think Allah intends for me on my path of righteousness if he makes it burn like the fires of the desert when I pee?" #7: "Damn it, Osama, I wish I knew how to quit you!" 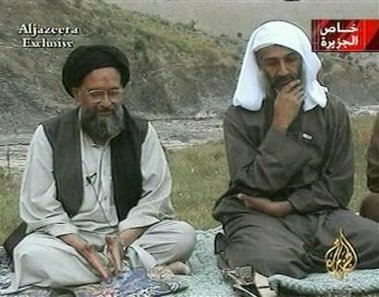 #6: "And why, friend Zawahiri, do you wish to know the name of the beneficiary on my life insurance policy?" #5: "Ayman, I think I will place this Golden Ace award in the niche of the cave above my bed... but I must remember to leave space for my eventual Nobel Peace Prize!" #4: "Okay, how about this? To attract more recruits, we offer a 401(k) with a Roth option and matching contributions. I mean, how much can a retirement plan for martyrs really cost?" #3: "We must think, brother Ayman... Chavez is a poser... There must be some way I can win my Cindy back from his clutches!" #2: "The very first thing we do when we establish the Caliphate is buy some chairs." #1: "You're a doctor, Ayman. What exactly did the infidel Bush mean by '20 kiloton suppository'?" NOTE: I plan (time permitting) to update the scoring again next week, following the latest contest, our 30th!